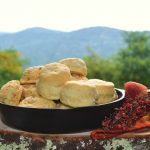 This is a tender soft inside crusty outside buttery biscuit that can be made plain or with added ingredients such as cheese, spices & herbs, or cooked meats. For Cheddar Cheese biscuit use same ingredients as stated but add 1/2 cup shredded Cheddar Cheese and 2 Tablespoons buttermilk. If biscuits are too dry add more buttermilk if too wet add either more cheese or bread flour. Dough after kneading two or three times will be the right consistency for rolling and cutting. Dip cutter in flour and push straight down into dough do not twist cutter to keep biscuits upright while baking. Grate butter with largest grate, place in freezer to set about 10 minutes. Combine the flour, baking powder, baking soda, sour cream, and salt in a large bowl. Cut frozen butter into the flour mixture with two knives or pastry cutter until mixture resembles coarse meal. Add the buttermilk to flour/butter mixture a little at a time. Stir until dough forms a ball, but do not over mix the dough. On floured surface, turn out the dough and roll out to 1-inch thickness. Using a 2 ½”-3” round biscuit cutter or rim of glass cut the biscuits and place in non greased skillet, or parchment lined baking pan. Bake biscuits in middle rack of oven for 20 minutes or until light brown. Remove from oven and brush tops with melted butter, return to oven for 5 minutes to a golden brown color. If biscuit tops brown too quickly cover with foil and continue baking. Grate the butter straight from the refrigerator onto a piece of wax paper and put in freezer to firm up-5-10 minutes. Use the larger grated pieces of butter, instead of the smaller pieces . The thicker the dough when rolling out the longer the biscuit needs to bake. The thicker the dough before cutting out the taller the biscuit will be. Avoid excess flour when rolling out the dough. Gently knead the dough 3-4 times to get a smooth top. Biscuits will be dry if you overwork the chilled dough. Use bread flour to make the texture light and fluffy. These are not gluten free biscuits. Bake biscuits in preheated hot oven.